We’re officially an old married couple! We survived wedding week, barely, we got married and we honeymooned all over Italy. It was more incredible than I can ever express. I am heading into Christmas season with the most full heart. I couldn’t imagine feeling more love than I’ve felt this year. I am so excited to share our rehearsal dinner, wedding and honeymoon with you guys soon but for now I’m back to cozy winter recipes and DIY tutorials. Today I’m spilling the black beans on my favorite crockpot soup recipe. I haven’t always been a big soup girl. Something about soup doesn’t make me feel like I actually ate anything.. crazy I know. I have three soups that I can make for dinner and feel like I’m full.. White Chicken Chili, Cheesy Enchilada Soup and Crockpot Chicken Tortilla Soup. 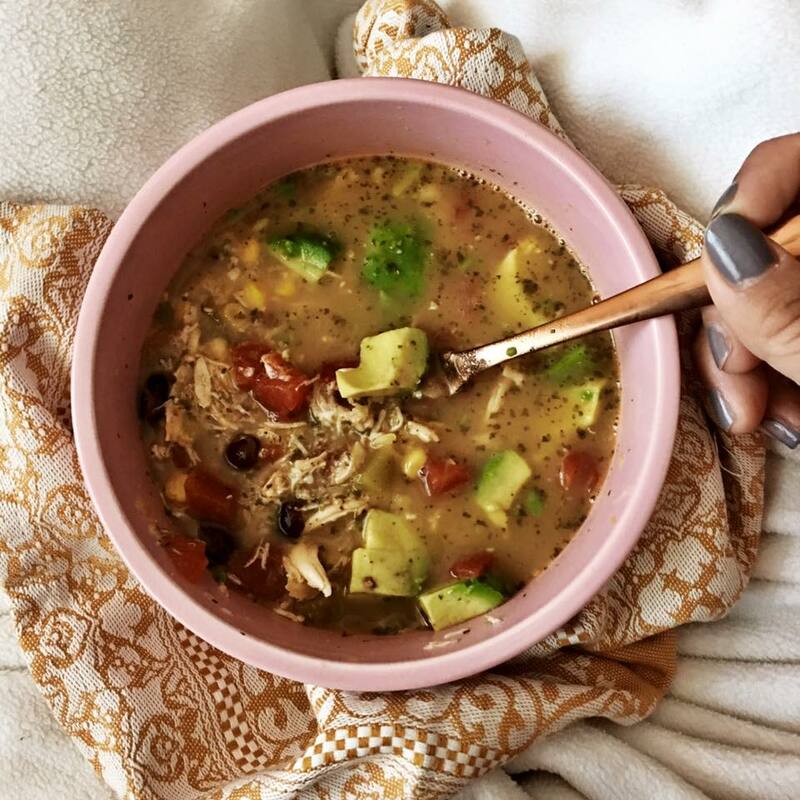 Lately I cannot get enough of these soups, they’re easy to throw together, perfect to eat snuggled up on the couch and make amazing leftovers. Out of the three soups I keep on repeat, today’s Crockpot Chicken Tortilla soup is the easiest to make. It’s basically dumping everything together in the morning and then enjoying when you get home. Zingy citrus, green chilis and a tiny, microscopic hint of spice (don’t worry if you want more, you can add hot sauce later!) topped with crunchy tortilla chips and creamy sour cream and avocados.. perfect to heat up your chilly winter nights! **If you want to make this creamy, you can add a brick of cream cheese to the crock pot when you add the other ingredients! My all time favorite part of this soup is how good the avocado chunks taste mix in. I could put 3 avocados in each bowl and still want more! If I’m trying to cut back on calories, I’ll lose the cheese and substitute sour cream for greek yogurt. Babe adds lots of hot sauce to his bowl, but I usually just squeeze an extra slice of lime in mine. I love citrus!